We love Arlo security cameras so much because you can mount them anywhere, inside or out, without having to run any cables since they’re completely cord-free. That said, we do have two problems with Arlo cams: they’re very expensive, and the battery only lasts for between one and three months per charge. 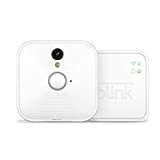 If you’re looking for a similar setup but you want much, much better battery life and lower price points, you’ve got to check out the Blink Indoor Home Security Camera System right now on Amazon. It’s still on sale at its deeply discounted Cyber Monday price, and the discounts apply to every system from 1-cam systems to 5-camera setups, as well as add-on cams.